Rustic wall art makes a statement of warmth and inspiration in your home; 24"w x 24.75"h on vertical pallet slats; a primitive natural look with distressed finish. 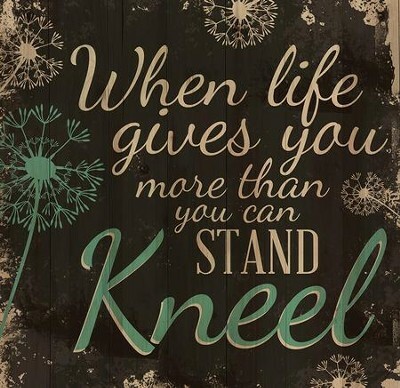 When life gives you more than you can stand, kneel. With wildflower motif. Sawtooth hanger for secure wall display; pine slats from actual pallets are attached to two cross beams; ready to hang on your wall. I'm the author/artist and I want to review When Life Gives You More Than You Can Stand, Kneel Wall Art.